Locked Out of Windows 8 and Forgot the Login Password? Locked out of your Windows 8 laptop? Forgot your Windows 8 password of local administrator account or Windows Live account? There are always situations where we are locked out of the computer and need to find a way to get back into Windows. In this tutorial we'll show you how to easily unlock Windows 8 computer in case the administrator account is locked out or disabled, or you simply forgot Windows 8 password. 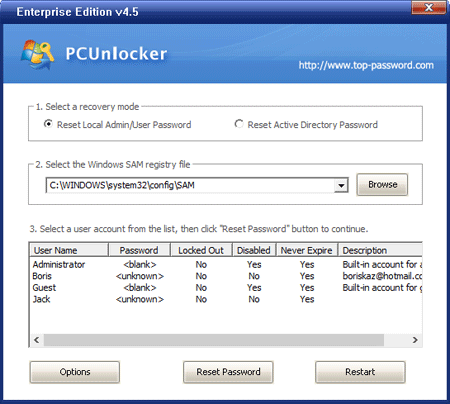 PCUnlocker is the all-in-one password recovery bootdisk which can deal with all of the password problems described above which cause you get locked out of Windows 8 computer. Follow the simple steps and you can unlock Windows 8 user account in minutes. Click here to download and save the PCUnlocker self-extracting Zip file to an alternative computer, then extract the ISO image file: pcunlocker.iso from it. Insert a blank CD/DVD or USB flash drive into the computer. Boot your Windows 8 computer. When it is powered on, check the boot-screen for setup key (i.e. 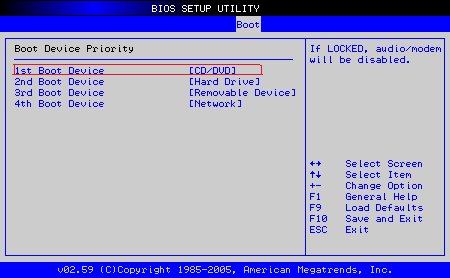 DELETE key, F8 key, F2 key) to enter BIOS Setup Utility. Insert the newly burned CD/DVD or USB flash drive to your Windows 8 computer, then reboot your computer. Now the computer will boot from the password unlocker CD/USB. Wait until the boot process is finished, you'll see the main window of PCUnlocker utility. Select a user account and then click the Reset Password button. The program will reset your forgotten password and also automatically unlock/enable the user account when it was locked out or disabled. Click the Restart button to reboot the computer and remove the password unlocker CD/USB, you can then log into your Windows 8 user account without any hassle. If you forgot Microsoft account password, just select the local user account which is linked to your Windows Live account and it will unlock both your local account and Microsoft account. Having such a password unlocker CD/USB at hand can be a life saver if your system refuses you to login in case you forgot Windows 8 password or your user account gets locked out accidentally.